‘Development’ first emerged as a subject area in the second half of the twentieth century. After World War II, scholars and practitioners sought to study the causes of poverty and so-called ‘underdevelopment’ in a more systematic and sustained way. These days, the substance of development studies – especially in relation to the developing world – focuses mainly on poverty reduction and improving ‘human development'. It is a dynamic field whose importance cannot be understated as the gap between rich and poor grows seemingly ever wider. In this short overview of the field, Jeffrey Haynes adopts a chronological and conceptual approach to introduce students to the central themes and theoretical perspectives in the study of development. In particular, he examines the emergence and consolidation of development theory and explores the internal and external factors which influence development in poorer regions of the world. Haynes also looks at key issues which impact upon the success of development including globalisation, conflict, the environment, gender and human rights. This book will appeal not only to students of development studies, but also to those interested in the politics, economics and sociology of the developing world. Jeffrey Haynes is Professor of Politics at London Metropolitan University. Chapter 1: What is development? "Haynes deserves much appreciation for writing such an eminently readable book for students of development studies." "This informed overview focuses on globalization, governance…and god(s). It identifies and examines the proliferating range of increasingly controversial ‘development’ issues towards the end of the first decade of the new millennium." "Only recently have world leaders and commentators had to admit that after four decades of their commitment to development the world is more unequal than ever. 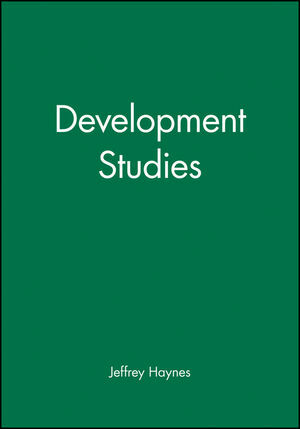 In this balanced and comprehensive overview of the field of development studies, Professor Haynes sets out the principal issues involved, and relates ongoing debates to current developments, while remaining clear and accessible throughout"
"This highly recommended book brings clarity into the field of development studies, particularly for beginners. It covers in accessible language most relevant issues, from globalization and international political economy to environment and religion. Furthermore the book handles the essentially contested nature of the subject in an impressively balanced fashion." "One of the best works to have appeared in the field of development studies in recent years. It is thorough in its coverage of issues and contemporary themes related to development, it is insightful and judicious in its treatment of the various topics, it is of utility to both generalists and specialists alike, and it is written in a style that is lucid and free of jargon. I strongly recommend it to anyone interested in the study of development." a high quality, authoritative introduction to international development by a leading scholar in the field. clear, accessible and concise, this is the ideal primer for students unfamiliar with the central themes and theoretical perspectives in the study of development. examines the evolution of development theory and explores the internal and external factors which influence development in poorer regions of the world. looks at key issues which impact upon the success of development including globalization, conflict, the environment, gender and human rights. part of Polity’s prestigious ‘Short Introductions’ series.